So, I’m mailing in my California Democratic Primary ballot today. Participating in democracy has never been easier. I don’t know why they have that rule that says you have to be registered as a Democrat to participate in this election though. That doesn’t seem fair or democratic. What if someone has a change of heart at the last minute and wants to vote for one of the candidates yet is a Republican? Not an implausible scenario but one that would disqualify them from the contest. This election feels historic, again. I wanted to make sure that I was involved, so I registered as Democrat for the first tie in my life last month (I’d always been Independent since changing from Republican sometime around 1990) and drove over to the post office yesterday to pick up the ballot. Someone at the Thumbprint art gallery show for Bernie Sanders last weekend reminded me that it was probably in the box, “I’ve already voted,” said the tall skinny kid that looked like he was barely out of high school, and I made the trip out to my p.o. box this month. So much is done by email these days I hardly every check my regular mail it seems. Used to be I’d be there every day picking up letters and CDs from bands and press agents hoping to get reviewed. Ah the good old days of ten or twelve short years ago. I remember coming back from a surf trip in 2000 and having a postal crate packed full of CDs stacked high, mostly from Epitaph, Nitro, and Fat Wreck Chords, that were patiently waiting for me behind the counter. Crazy the amount of work that went into reviewing music back then. Now it’s mostly all done online for free by fans. Maybe they’ll begin to do elections online soon too. 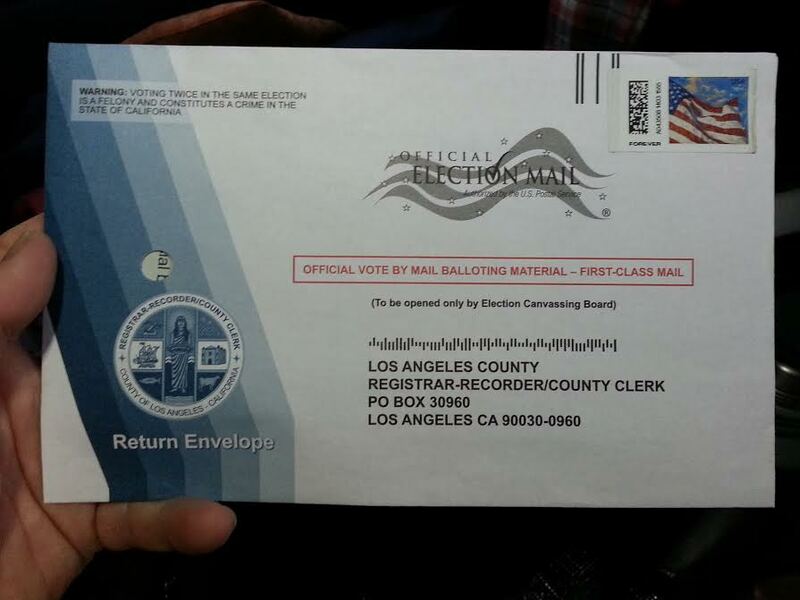 So here’s my ballot envelope. Here goes nothing, democracy. Let’s hope for the best. The future is now. California Democratic Primary election ballot envelope, about to be mailed, 5-15-16.